From December 12, 2018 to January 25, 2019 the exhibit of the show Food for the Soul: Seven Washington Artists was hosted at the Salve Regina Art Gallery on campus. The exhibit showcased the artworks of local painters and graphic artists from Art Enables. Art Enables is an Art Gallery and Vocational Arts program that helps artists with cognitive disabilities by making opportunities for them to create and sell their artwork. The show was curated by Libby Federici, a senior, Art History major. This was the first show that Federici has ever curated. The name Food for the Soul comes from a quote by Catholic activist and political radical, Dorothy Day. The show had been in the works since April 2018, and for Federici, the experience of curating her first show was very rewarding. Bethlehem House was the platform of the show, and is the home of one of the featured artists, Helen Lewis. Lewis is a professional artist and one of Federici’s good friends. “It was really from her that I began to think about creating a show, and the community at Bethlehem House ultimately put me in touch with Art Enables and the other artists,” said Federici. 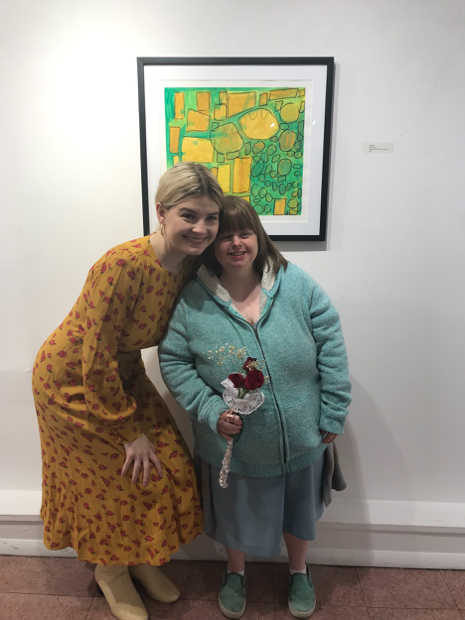 “I could tell Helen loved the show,” said Colleen Connor, a senior nursing major who is paired with Helen Lewis in Best Buddies, a campus organization which fosters friendships between students and adults with physical and intellectual disabilities. The most challenging part for her was the editing of the proposal, press release, the curator’s statement and budget, and others. “There was a lot of writing and re-writing involved, in part because I wanted to be certain I was using appropriate and empowering language to describe both the artists and their work,” Federici said. “For what it was meant to be in our little community, I think the show served a wonderful purpose and I’m very pleased with the result,” said Federici. She plans to go to graduate school after college and either work in a museum or go into art education. Many Catholic University faculty and staff assisted Federici with the organization of the event. Dr. Nora Heimann, Chair and associate professor of the Art department helped with the writing and editing. Salve Regina Gallery Director and Assistant Professor, John Figura, assisted Federici for installing the show. Assistant Professor of Digital Art and Studio Art advisor, Jonathan Monaghan, helped with the digital promotions. Assistant to Chair, Peter Gribbin, helped her at anytime. Allie Frazier from Art Enables, helped with framing, packing and payment. Two of the artworks from the exhibit have been sold and there has also been inquiries about two other pieces.